A beautiful trumpeter swan flew over the Minnesota River on my way to work today (this happened once before in 2009.) I don't think anyone can really comprehend the size of a swan in flight. It's huge! With a 10 foot wingspan they dwarf Canadian Geese's 6 foot wingspan and they are nearly three times as heavy at 36 pounds. It is beatiful and daunting to see them soaring over you. Brings back images in your mind's eye of the Indian's "Thunderbird" legends - though they are less fierce. 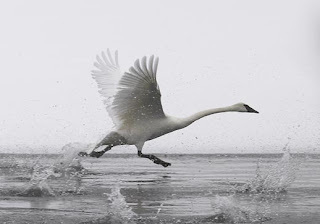 The largest species in general is the Trumpeter Swan (Cygnus buccinator), which can reach an overall length of 1.82 m (6 ft), a wingspan of 3 m (10 ft) and a weight of 17.3 kg (38 lb).